As director of Cornell University's acclaimed Food and Brand Lab, Brian Wansink has authored a lot of attention-getting studies on eating behavior. One from 2009 especially rankled the stewards of one of the most famous cookbooks of all time. 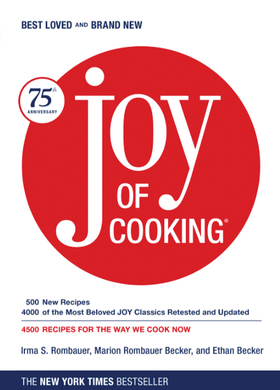 "The Joy of Cooking Too Much" study laid part of the blame for the obesity epidemic on the classic cookbook, which has been updated seven times since it was first published in 1936. Wansink and frequent collaborator Collin R. Payne looked at 18 recipes included in each edition, and say they found calorie counts for 14 of those had increased an average of 44% over the years. At the time, John Becker, great-grandson of the cookbook's originator, and his wife, Megan Scott, questioned the researchers' methods in a blog post and noted the small sample size, but did little else. "We assumed that he was probably correct," Scott told the New Yorker. "If we had wanted to impugn the reputation of a sitting Cornell department head, I think we would've found a really tough row to hoe." A few weeks ago, however, BuzzFeed News published an expose looking into Wansink's methods and concluded he "turned shoddy data into headline-friendly eating lessons that they could feed to the masses." In the story, scientists dispute Wansink's findings, including a psychologist who termed his version of science "storytelling." They have accused Wansink of "p-hacking"—splicing and manipulating data to achieve a desired result. The story led Becker to tweet: "We have the dubious honor of being a victim of @BrianWansink and Collin R. Payne's early work." Wansink has defended his methods and studies. And Cornell is investigating.